Om is the universal name of the Divine. It is often chanted at the beginning and the end of Yoga, and is a mantra used during meditation. Om comprises a union of mind, body and spirit, representing the entire universe; past, present and future. Yogis attest to the profound ability of the vibrations of OM to settle the mind and bring serenity. 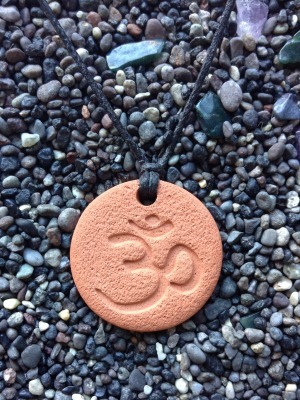 The OM Pendant measures 2.8 cm (1 1/8 in) across. Really beautifully shaped Aum symbol. Have given as gifts to several people who enjoy practicing yoga. Very nice size and very well made. The quality of these pendants is much nicer than the price would indicate possible.